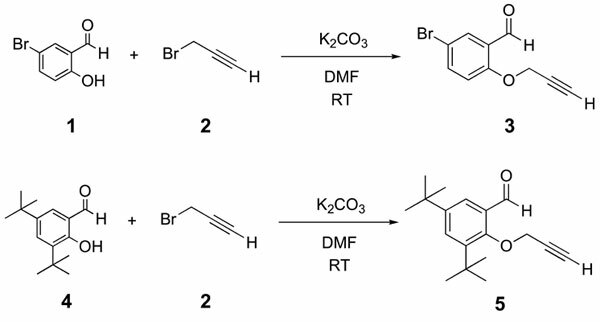 5-bromo-2-(prop-2-yn-1-yloxy)benzaldehyde (compound 3) and 3,5-di-tert-butyl-2-(prop-2- yn-1-yloxy)benzaldehyde (compound 5) were synthesized via nucleophilic substitution reactions. Compound 5 showed higher antioxidant capacity with respect to compound 3 in all the four different antioxidant activity methods used. Moreover, in phosphomolybdenum assay, compound 5, with 1.1 proportion value, showed almost the same total antioxidant capacity compared to universal trolox standard. Furthermore, Broth microdilution method and agar disc diffusion tests demonstrated that the same compound also exhibited good antibacterial activity towards the bacteria Bacillus subtilis. Finally, both of the benzaldehyde compounds showed high antifungal activity against Aspergillus niger. In this study, compound 5 (IC50: 54.3 µg/ml) showed significant cytotoxic activity against breast adenocarcinoma cell line MCF-7 with respect to compound 3 (IC50: 173.4 µg/ml). 2-(prop-2-yn-1-yloxy)benzaldehyde, antioxidant, antibacterial, antifungal, anticancer, human breast carcinoma.